Hot on the heels of the release of their all new a capella album, YBC is busy preparing for two all new shows, to be held on Monday (Queens College) and Tuesday (Bergen Performing Arts Center in Englewood, New Jersey) nights of Chol Hamoed. Joining YBC onstage will be the all new Chevra and Ohad. 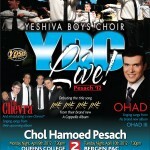 You don’t want to miss YBC Live 2012, sure to be the talk of the Jewish music world!